1. What is a Food Processor? Whether a gourmet or casual cook, everyone loves their food processors. Being the kitchen enthusiast that you are, you are simmering with ideas for using your best food processor and perusing all sorts of cookbooks for wonderful and unusual dishes. Food processors have no unwanted “side effects” when it comes to whipping up anything delicious. You will have less mess, more power and quicker end results when you hook up with one. With a plethora of attachments and accessories, the processor beats a blender bar none. Check-out food processor reviews online for the positive comments from buyers or owners like you and read ours here. Our food processor buying guide is full of tips. You might first like to know that the first electric food processor was made in Germany in 1946. The food processor came to North America in 1973. It didn’t take long for cooks to realize what a useful time saving appliance this is. My parents sent me my first one for Christmas in 1980 and I still use it. Food processors have indeed transformed cooking processes by home users and chefs alike. 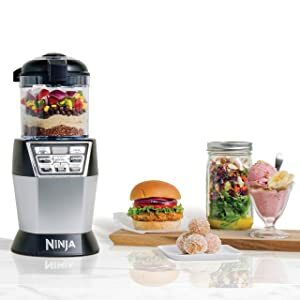 A food processor is a small versatile kitchen appliance to save you work for tedious tasks usually done with a knife or chopping device. You will be able to slice, chop, and grind vegetables and meat, puree, and shred almost any food. Some models will make vegetable and fruit juices, whip up cake batter in a jiffy, make nut butters, and knead bread dough. In today’s world, we use food processors with electric motors. There are manual hand cranking units (choppers) still available to be used for lighter specific food preparation such as salsa if you want it at a texture you can watch and control at a quick glance. The chopper is a food processor but smaller in size. It is better for chopping food rather than making drinks. I have both and use each one for distinct functions. See the manual food chopper on the right. You probably know that food processors are comparable to blenders in many ways except the main difference is that you will have attachments of interchangeable blades and disks for cutting the form you want with your vegetables and fruit. A blender has a single fixed blade. This is my many-years-old blender that made fabulous jalapeño jelly from a small Mexican chili. I take it out occasionally to make the jelly again. It works and the glass top can go into the dishwasher. With a food processor, you use little to no liquid whereas with a blender liquid is required for the food to move about. 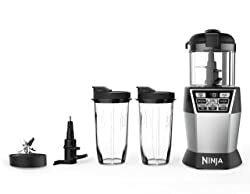 A food processor has large bowls while a blender has a tall high container with a lid for the top to eliminate food from flying out while it blends. The electric motor sits in the base of the unit. The motor turns a vertical shaft. Another small device fits around the shaft. All that’s needed now are a bowl, cutting blades or other attachment to make it work to do what you want. Safety devices are part of the design to prevent heat overload to the motor known as a thermal overload protector. The motor will not work if the bowl at the bottom is not secured properly to the base. No matter what size you buy, the basics are the same with an electric motor, a bowl with lid having a tube to push food through with a plunger, and an assorted set of attachments. Some brands and models come with small and large bowls that sit on the same base. There are more bowl sizes and they come with more expensive units or can be purchased separately. 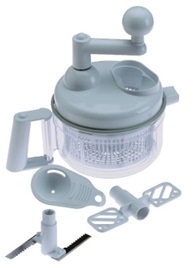 The attachments fit over the shaft inside the bowl of the basic food processor. The standard attachments are an S-shaped Sabatier blade and a metal slicing and shredding disc usually made of stainless-steel. The Sabatier blade is better to have made of metal rather than plastic to stay sharper longer. You can buy different discs separately if they don’t come with your food processor. The slicing and shredding discs make fine, medium, and coarse food morsels. Most high-end food processors come with even more attachments and these are what most of us buy a food processor for—capabilities. Shredding/Slicing Disc, Reversible—one side does shredding: cabbage, carrots, potatoes, chilled cheese; the other side does slicing: Apples, cucumbers, mushrooms, carrots, cabbage, potatoes, tomatoes, pepperoni, peppers, radishes, firm chilled cheese. Chopping/Mixing S-shaped Sabatier Blade—Chop: nuts, meat, garlic, peppers, celery, herbs, bread for crumbs, crackers; Mince/Puree: vegetables, fruit cocktail, salad dressings, pureed soups, baby food, sauces; Grate: cheese for example chilled Parmesan. Citrus Juicer—is an attachment that turns the knob to squeeze juice from oranges, lemons, lime, and grapefruit. Julienne Disc—with its row of short, sharp protruding teeth it’s handy for vegetables such as raw carrots and raw beets to slash into slender lengths, celery, and red onions for Peruvian ceviche. Julienne, allumette, or French cut are matchstick thin short slices that delight the palate. 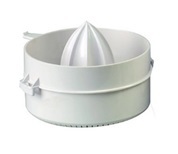 Dough Blade/Beater/Hook—for mixing up pizza and bread dough. Different manufacturers use different styles. 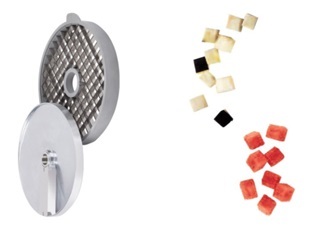 French Fry Disc—creates fatter pieces comparable to the julienne disc with larger slots. This disc can make white and sweet potato fries to bake or make crispy tender inside with your deep fryer. Egg Whip—with open 2-arm paddles it will aerate egg whites to be fluffy to have high-peaked meringue for your pies and other desserts or beat up whipped cream or frothy drinks like milk shakes. Specific models offer this such as KitchenAid®, not reviewed here. 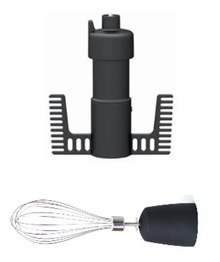 Whisk—is offered with some models and used for stirring one ingredient into another for no lumps. See the dicing and spiralizing discs at the end of the page. 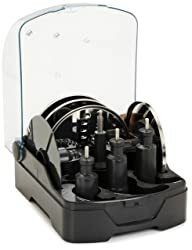 There are disc holders available for storing all the discs and attachments on Amazon.com® and one unit reviewed here has that container with its unit. It’s a new toy that you don’t have the slightest idea how to work. You must read the User’s Manual and read the instructions carefully learning what disc does what and how to attach what one to do what you want done. The blades are very sharp and use with care. It’s pretty straight forward to use the shredding disc to grate carrots, zucchini, and cheese. For perfection in slices every time, the slicing disc will do that. Push the food with the plunger on top. Easy peasy. 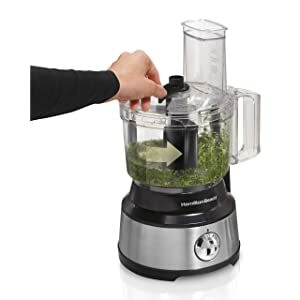 Because all best food processor brands are similar, yet a bit different, it’s best to read the data that came with yours and to read the reviews below that will cover some of it as well if you are a new buyer. The Braun German engineered model number FP3020 food processor has a powerful motor and comes with 7 attachment blade discs plus a free chopper blade and citrus juicer for your extra dose of vitamin C in your morning orange juice. The color is white with some splashes of green. With this unit you can chop, slice, whisk, and knead. It has 2 controls with variable 11 speeds plus pulse. This gives you control over what you’re making without a mess. Make baby food and nut butters to your heart’s content. You’ll love the smoothness of it when finished. It is easy to clean and all parts are safe in the dishwasher. Of course, you don’t put the base with electronics and motor in the dishwasher—but you can wipe it down with soapy warm water. The cord is always a consideration in the kitchen for users. I know I don’t like dangling cords to trip over or hanging all over the counter top. This unit has a special cord holder on the back to keep it tidy and out of your way. For most of us, this is the best feature on any appliance or device using cords. The Braun is easy to put together and store with its compact design when you’re finished using it. It is quiet using very little power. You will receive the Braun Mini Work Bowl, perfect for processing small amounts of sauces or nuts as a bonus gift from Braun. Plug the UL® listed cord into a 110/120-Volt, 50/60 Hz alternating current (AC) adapter for USA, Canada, and Mexico outlets. Outside the USA, Canada, or Mexico you will need to buy a 220/240-Volt adapter. The motor is 600-Watts with up to 900-Watts peak power. The unit does not use batteries. The dimensions are base only 12-1/4-inches wide x 8-inches deep x 9.5-inches high and with the bowl and cover on, it measures 14-inches wide x 8-inches deep x 13-3/4-inches high and with the top off 9.5-inches high. It weighs about 8-pounds.The material is 18/8 steel. The mini chopper attachment and the mini work bowl are the same thing. The processing bowl locks onto the motor base. The processor will not start until the lid is properly closed. Pulse button and pre-set speed function. 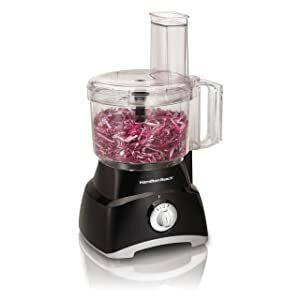 Gift-wrapping is available for your family and friends that you want to have this fabulous food processor. You will receive the A/C adapter and User’s Manual with a 1-year Warranty from Braun. It is made in Hungary. The Breville®, model number BFP800XL comes in stainless steel, cranberry red, or black sesame. This divine unit is a plus for home users and chefs love it. 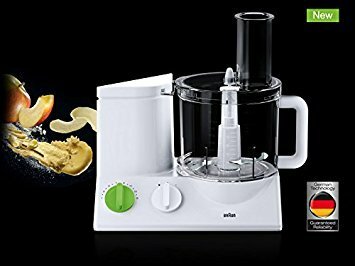 Turn your peanuts and other nuts into butter, and slice and chop your veggies with the press of a button. It comes with many accessories and attachment tools. The LED display lets you see the timer counting up and down. Make bread dough, baby food, sliced or chopped meat and veggies and just about anything in this powerful workhorse. It makes French fries from white or sweet potatoes and a hundred other functions. The 4 sharp chopping blades improve consistency when processing larger quantities of meat and vegetables. Choose from 3 feed chute options: 5-inch large feed chute, 2-3/4-inch mid- feed chute and 1-1/2-inch mini- feed chute. 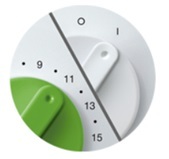 With the slicing disc select from 24 settings from paper thin 0.3 mm to thick 8.0 mm. The feed chute safety system prevents the motor from operating unless the bowl, lid and large food pusher are correctly locked in position. The large bowl capacity is 16-cups and the small bowl holds 2.5-cups. The speed settings are on/off and pulse. The dimensions are 11- x 8- x 18-inches and weighs 19.4-pounds. Plug the 36-inch UL® listed 3-prong cord into a 110/120-Volt, 50/60 Hz alternating current (AC) adapter for USA, Canada, and Mexico outlets. Outside the USA, Canada, or Mexico you will need to buy a 220/240-Volt adapter. The motor is 1200-Watts. The unit does not use batteries. The unit is die-case metal for the base. The bowls are BPA-free plastic and the blades are stainless-steel. The reversible shredding disc and blades include a micro-serrated universal S-shaped blade. This food processor has a cord storage area in the bottom. 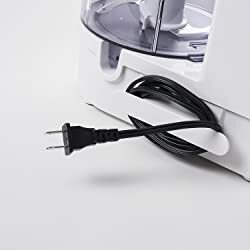 The hole that the cord comes from on the bottom of the machine will allow for the cord to be fed back into it to store the excess. Processing bowl and lid: hand wash in hot, soapy water using a mild detergent. Do not use a scouring sponge or pad or abrasive cleaners as they will scratch the plastic surface. The plastic parts may occasionally be washed in the dishwasher (top shelf only). It is not recommended on a regular basis, as prolonged exposure to hot water temperatures and harsh detergents will damage and shorten the life of the plastic. Gift-wrapping is available for your family and friends that you want to have this superb sous chef food processor. You will receive the A/C adapter and User’s Manual with a 1-year Limited Product Warranty and a 25-year Motor Guarantee. It is designed and engineered in Australia and made in China. 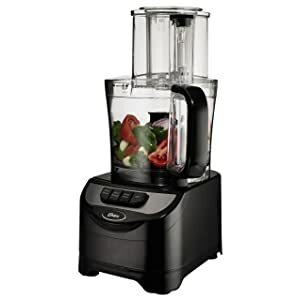 The Nutri Bowl™ model number NN102 is a cleverly designed small food processor for making drinks and dough too! For the price, this is value-added for all the things it can do and is a best seller on Amazon.com®. It is so adaptable to do so many different things. It is powerful to not stop moving what you need it to for everyday mixing of smoothies, juices for the kids, baby food, and even dough. 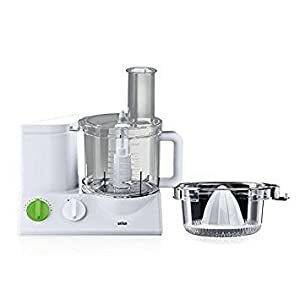 This is not a juicer, so it will leave all the fiber in the juice.This is the only best mini food processor reviewed here. Whip up peanut butter and nut milks, hummus, pesto, and rice cauliflower. It chops on the auto mode and you can always use the manual mode for what suites you. It does not shred such foods as cheese and cabbage for Cole slaw. Pulse by hand to grind salmon, hamburger, and other meats. The 4-cup bowl will chop, puree, and make dough to perfection. The 2 24-ounce Nutri Ninja® cups with spouts on the lids for the kids and you too are ideal for when you are on the go. Timed, pulsed, blending, and other features will work diligently for you for your ideas. The parts are BPA-free and dishwasher safe. The parts are plastic so do not put hot liquids in them. The dimensions are 10.44- x 14.37- x 16.14-inches and weighs 6.14-pounds. Gift-wrapping is available for your family and friends that you want to have this multi-purpose small processor. You will receive the A/C adapter, accessories, and User’s Manual with a 1-year Limited Warranty with customer service in the USA at (877) 646-5288. It is made in China. 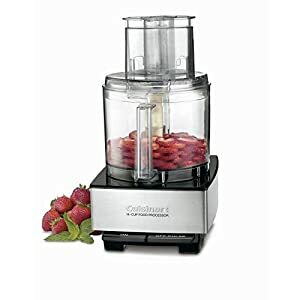 The Cuisinart® model number DFP-14BCNY comes in brushed stainless-steel, white, copper, black, and red, is affordable and a best-selling food processor on Amazon.com®. Cook for your family and guests with this large capacity bowl. It’s easy to use and will chop whole fruits and veggies, shred cheese, knead dough and a whole lot of other things. While it does make dough, a stand-mixer is better for that task. This model is the latest version of DFP-14BCN. The S-shaped Sabatier blade had cracking issues so Cuisinart® fixed that and this one does not crack. It is safe to put the parts in the dishwasher but better to wash by hand. Dishwashers and the harsh detergent tend to be rough on plastics. 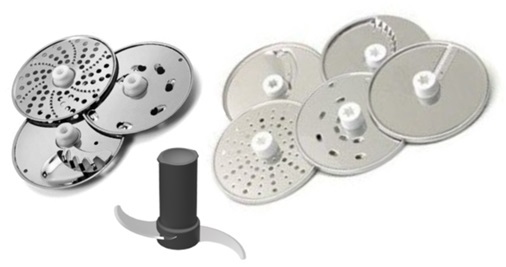 The stainless-steel discs are not a problem for the dishwasher to clean. Just wipe the base down and you’re ready to use it again. The plastic parts are BPA-free. The bowl has a handle, and the feed tube on top is extra-large for bigger chunks. The sleeve assembly and food pusher are large and it also has a small feed tube with pusher. This model does not come with a small bowl. It has one speed plus a pulse button. The dimensions are 11- x 7.90- x 14.80-inches at 100-cubic feet and weighs about 18.4-pounds. Height of base: 5-1/4-inches, height of accessory power shaft: 8-inches, height of bowl when on the base: 10-3/8-inches, height of feed tube when bowl is on the base: 15-1/8-inches. Plug the UL® listed 3-prong cord into a 110/120-Volt, 50/60 Hz alternating current (AC) adapter for USA, Canada, and Mexico outlets. Outside the USA, Canada, or Mexico you will need to buy a 220/240-Volt adapter. The motor is 750-Watts. The unit does not use batteries. Gift-wrapping is available for your family and friends that you want to have this multi-purpose food processor. You will receive the A/C adapter, accessories, and User’s Manual with a 3-year Limited Warranty on the entire unit and a 5-year Warranty for the motor. It is made in China. The Cuisinart® model number DLC-8SBCY is a stunning kitchen appliance in brushed chrome. The white unit is DLC-8SY for the same price on Amazon.com®. The 11-cup bowl with large feed tubes and compact chopping and kneading cover make this a pro model to be used by home users or professional chefs. With this feed tube, you can stuff whole vegetables and fruit into it. The dough blade will make single loaves of bread, pizza dough, pie crust, brownies and whatever your sweet tooth is craving. You will receive 2 different slicing discs, a disc for shredding cabbage and carrots, and of course, a chopping and mixing blade. The 2 different sized pushers make prep time a snap with all the different food sizes making culinary delights for everyone. And cleanup is a breeze putting the stainless-steel discs into the dishwasher. The BPA-free plastic parts do better and last longer by hand washing them. Grate cabbage for slaw and the carrots to go into it, grate cheese for the pizza, and any other vegetables and fruits for your recipes. The lid fits snugly over the bowl to keep food from flying out. It will puree to make baby food. The dimensions are 7-inches long x 11.25-inches wide x 14.50-inches tall at 1.23-cubic feet and weighs 18.5-pounds. Plug the UL® listed 3-prong cord into a 110/120-Volt, 50/60 Hz alternating current (AC) adapter for USA, Canada, and Mexico outlets. Outside the USA, Canada, or Mexico you will need to buy a 220/240-Volt adapter. The motor is 625-Watts. The unit does not use batteries. 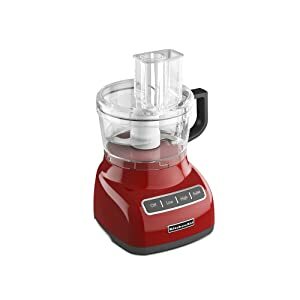 The KitchenAid® 7-cup food processor in Empire Red, model number KFP0711ER, is a topmost best-selling unit on Amazon.com®. The ExactSlice™ system has enhanced speeds to give you the exact result you want each time you use it. With the low, high, and pulse modes you have the options at your fingertips to cut and slice hard and soft foods quickly and easily. You will appreciate the UltraTight™ Seal that actually locks down tight to not have leaks while filling the work bowl to the top with goodies. A specially designed locking system is featured with a leak-resistant ring that allows you to fill the work bowl to capacity with ingredients. Use the 2-in-1 feed tube for narrower or wider products to continually slice or shred. You can make all sorts of dough including stiff bread dough. It will slice and shred vegetables for salads and make French fries. It has an internal adjustable slicing disc and reversible shredding disc with a multi-purpose blade. The base material is polycarbonate plastic and the blades are stainless-steel. The parts are dishwasher safe on the top rack. Wipe down the base and it will shine again. The dimensions are 9.9-inches deep x 14.6-inches tall x 10.1-inches wide and weighs about 10-pounds. Plug the UL® listed 3-prong cord into a 110/120-Volt, 50/60 Hz alternating current (AC) adapter for USA, Canada, and Mexico outlets. Outside the USA, Canada, or Mexico you will need to buy a 220/240-Volt adapter. The motor is 300-Watts. The unit does not use batteries. Gift-wrapping is available for your family and friends that you want to have this food processor. You will receive the A/C adapter, accessories, and User’s Manual with a 1-year replacement Warranty. It is made in China. 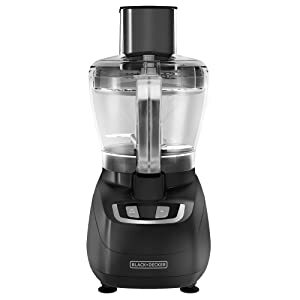 The Hamilton Beach® food processor model number 70740 comes in a chrome finish with black and is a best seller on Amazon.com®. It’s much easier and faster to use than cutting by hand. It is a quick 2-speed plus pulsing for chopping onions, veggies, fruits, salads, grate cheese, and make pesto and sauces. The lid will flip over for compact storage. 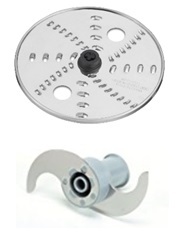 You will receive a stainless-steel slice and shred disc and a chopping S-shaped blade. The feed chute is large and will hold an entire block of cheese eliminating you from cutting pieces first. The S-blade is used for pureeing, mixing, and chopping. The slice and shred disc is reversible. Prepare salsa, mix up biscuit dough and make nut butters plus puree for the baby. Make hummus and guacamole—but smoothies, not really. A blender is better for a smoothie. Grind up meat for burgers and meatloaf too. The parts are dishwasher safe but just wipe down the outer housing base with motor. The dimensions are 15.57-inches high x 10.71-inches wide x 8.4-inches deep and weighs about 6-pounds. Plug the UL® listed 3-prong cord into a 110/120-Volt, 50/60 Hz alternating current (AC) adapter for USA, Canada, and Mexico outlets. Outside the USA, Canada, or Mexico you will need to buy a 220/240-Volt adapter. The motor is 450-Watts. The unit does not use batteries. Gift-wrapping is available for your family and friends that you want to have this food processor. You will receive the A/C adapter, accessories, and User’s Manual with a 1-year Warranty. It is made in China. 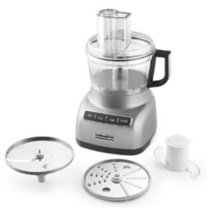 The Hamilton Beach® food processor model number 70730 is a best choice selling unit on Amazon.com®. The integrated bowl scraper is an innovative concept to keep from turning off the unit removing the lid just to scrape down food on the inside with a spatula. It you don’t like using it, remove it. You can use the bowl scraper when the device is either on or off. In stainless-steel with black, it will go with any kitchen décor. With the 2 speeds plus pulse you can chop, mix, slice, puree and put an entire block of cheese into the large feed chute on top. The bowl, lid, and stainless-steel discs and blade are dishwasher safe. The plastic parts are BPA-free. With the discs being reversible and labeled, you will not have to guess which side does what. When you do use the attachments, do not process foods past the Max indicator line on the bowl. You will see this food chart in your User’s Manual. The differences between the Hamilton Beach® 70740 and 70730 is that the 70730 has 10,000 volume while the 70740 has 8,000 volume and the 70730 has the mix function. The metal finish of 70730 is stainless-steel. The 70740 is chrome. Both have dishwasher safe parts. The dimensions are 8.43-inches deep x 15.47-inches tall x 10.25-inches wide and weighs about 6.2-pounds. 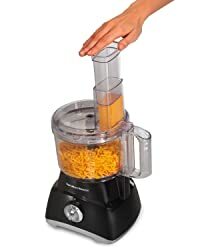 The Oster® food processor model number FPSTFP1355 is inexpensive and a best seller on Amazon.com® for your total food preparation using less time and energy. Why cut up foods with kitchen knives, box graters, or a mandolin when this will do it faster without taking your fingers off. The BPA-free parts are dishwasher safe and the bowl is plastic. With the 5-inch wide largemouth food chute and small and large pushers, your job is easier when making a colorful healthy salad or vegetable medley. 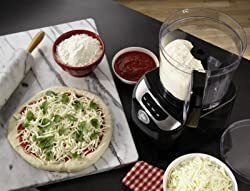 You will be able to shred and slice, make doughs—pizza, cookie, cake, and small loaves of bread with the included dough blade. It will hold a hefty 10-cups of anything up to the Max line and the lid will lock for added safety. Puree foods and baby foods using the pulse function. The unit also has low and high power. This food processor is not able to chop ice since it will damage the bowl, dulling the chopping blade. The stainless-steel S-shaped blade will chop anything you need from delicious appetizers to decadent desserts. Are you still using yeast and kneading by hand to make bread? Then you sit the bowl someplace warm covered with a towel to let it double in bulk? Then you punch it down… and your day is gone. This processor will do all the work for you and doesn’t take all day to do it. Make all your doughs with the Oster® food processor. Store the blades and accessories neatly stacked inside the bowl for convenient storage organization. The dimensions are 9-inches long x 16.5-inches tall x 7-inches wide and weighs about 6.2-pounds. Plug the 2-foot UL® listed 3-prong cord into a 110/120-Volt, 50/60 Hz alternating current (AC) adapter for USA, Canada, and Mexico outlets. Outside the USA, Canada, or Mexico you will need to buy a 220/240-Volt adapter. The motor is 500-Watts. The unit does not use batteries. Gift-wrapping is available for your family and friends that you want to have this dough making food processor. You will receive the A/C adapter, accessories, and User’s Manual with a 1-year Warranty. It is made in China. BLACK+DECKER® has been making power tools, outdoor yard care equipment, coolers, and accessories since 1910, to include small kitchen appliances. 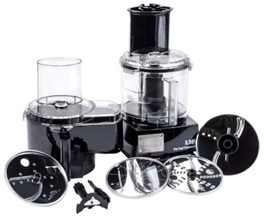 The BLACK+DECKER® model number FP1600B food processor is a cheap food processor and sells well on Amazon.com® for under $20. It has a smart cord wrap to manage the cord for safety. Just like your stainless-steel cookware, the blades are made of strong and durable stainless-steel that can be put into the dishwasher. The shredder, chopping blade, and slicer do all the work for a delicious meal or snack. With the pusher for food you put into the food chute, you will be amazed at how quickly this process goes by guiding the food to the disc. For safety, the lid locks and the blades will not operate until it is secure. The bowl holds copious amounts of vegetables or ingredients at one time. The power is on and off plus pulse. It will chop finely and even puree. It will not knead dough and there is no dough blade with this model. It will make nut butters, hummus, baby food, mashed potatoes, and slice and shred. It does not dice. How can it—that takes another 90-degree angle blade. The dimensions are 7.8-inches long x 15.67-inches tall x 11.26-inches wide and weighs about 5.8-pounds. Plug the 2-foot UL® listed 3-prong cord into a 110/120-Volt, 50/60 Hz alternating current (AC) adapter for USA, Canada, and Mexico outlets. Outside the USA, Canada, or Mexico you will need to buy a 220/240-Volt adapter. The motor is 450-Watts. The unit does not use batteries. Gift-wrapping is available for your family and friends that you want to have this food processor. You will receive the A/C adapter, accessories, and User’s Manual with a 2-year Limited Warranty. It is made in China. Always read the instructions and User’s Manual before you start using the unit. There are no dicer attachments for food processors. That would require the engineering of a blade to go at a 90-degree angle and it hasn’t been built to my knowledge and understanding of mechanics for these small home units. To dice, cut thick slices with the food processor disc, lay the slices on your cutting board, get out a ceramic knife, and cut across the long pieces to make dice. Cubing grids do exist for processors and cost about $100 used by professionals. No food processors are quiet; you need to be able to hear the process. If you want julienne cuts a mandolin is probably the best choice because with the round disc on food processors, the product will be curved rather than straight. Food processors are not juicers. That is a separate appliance. Food processors will make smoothies and liquids; however, the fiber will be in the liquid juice. 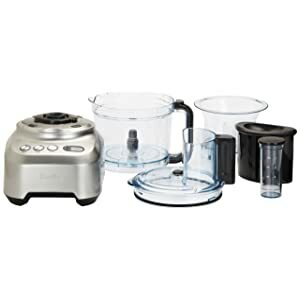 Food processors, blenders, and stand mixers do similar functions with variations. When you want to make a lot of dough, buy a stand mixer with dough hooks and beaters. They come with egg whips and citrus juicers and other fun attachments. 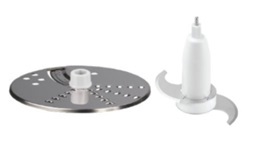 Commercial style food processors come with dicing disc kits. Home users love these too. It’s a 2-dimensional cut: first it makes a slice and then it cuts again to make the dice while turning. You can see in the square configuration the shape. These food processors with dicing kits start at about $165. I know I love dicers and what cook doesn’t? The food dice feel good in your mouth when chewing, for instance homemade pickled diced beets. The small cubes look appealing on a platter of veggies that are julienned, sliced, and diced for your guests, family, and reunions. Most best food processors are not able to chop ice because it will damage the bowl, dulling the chopping blade. They will puree food using the Pulse function to the desired consistency. Read your User’s Manual for learning about chopping ice. 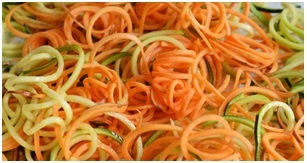 We also love spiralizing our zucchini, veggies, and fruits too. Spiralizing attachments are available for food processors and are sold as separate small units and handheld units dedicated to that task only. We love all the gadgets now available for not only making tasty foods but to have them pretty with a different texture too. Hard winter squash makes excellent spaghetti for the kids. We hope you enjoyed the guide and reviews that has your mouth watering to make something special for your family and friends. The units are easy to use, easy to clean, and extraordinary eating pleasures both for the eyes and taste buds, not to mention health. Leave your comments and questions below and have fun shopping. Helpful article. 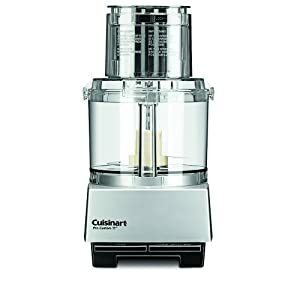 I am looking for a smart and compact food processor to create homemade delicious baby food, and I love the “Cuisinart® Pro Custom 11™ Food Processor 11-Cup”. Thanks for helping me to find out the perfect food processor. Thanks for visiting our website! Yes, Cuisinart® will make baby food and other foods as well!